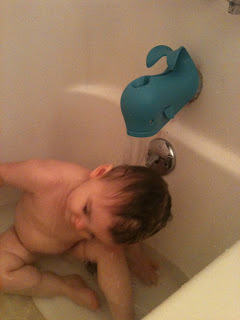 We have learned that my one-year-old is part fish. Her antics in the bathtub leave no other explanation for her fearlessness and excitement over water. 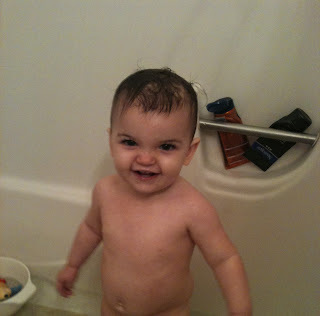 This week she laid on her belly in the tub and dunked her whole face under water for about two seconds. She did this over and over. How many adults still fear submersion, let alone an 18-month-old? This handy plastic cover is totes adorbs, and is perfect for keeping little heads from bonking into the sharp, metal tub faucet. Ce has a blast with hers. 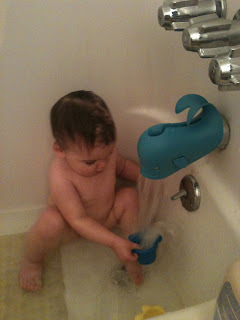 Now she can rinse the shampoo out of her hair and I don't fret about a head injury. 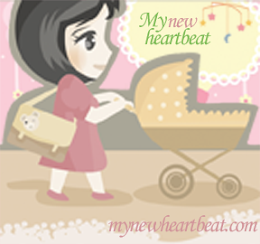 I bought mine at Bed, Bath & Beyond but found them at several of the big box baby stores and online. It is $12 and very handy. 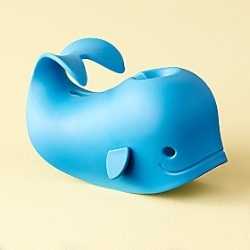 The sides adjust to tighten around the spout so curious hands can't pull it off, and the tail is also a handy hook when you don't need Mr. Whale's protection. We give it two squeaky clean thumbs up.